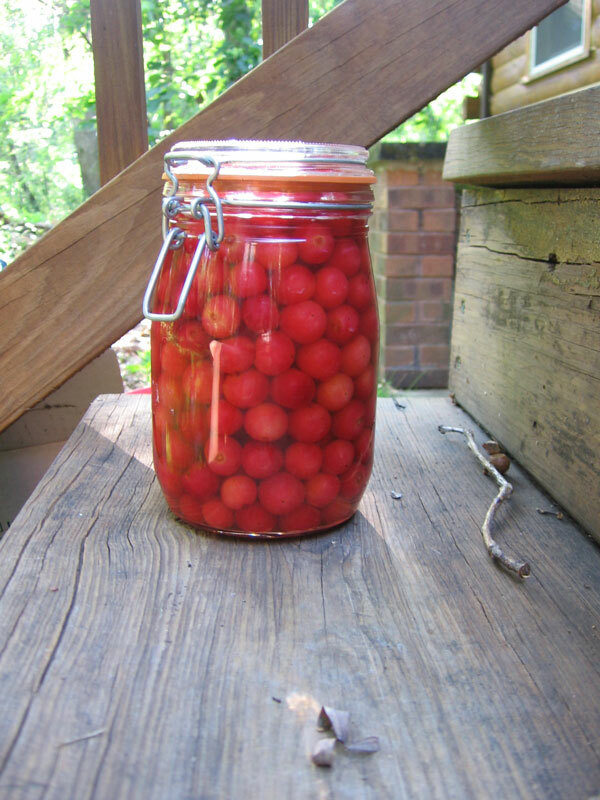 I have a jar of cherries on my porch. They are solar cooking in a broth of sugar and whiskey. I got sick of pitting all the cherries, and this recipe called for unpitted (and unwashed) cherries, whiskey, and sugar. I had all the ingredients, as well as a quart jar, so I made use of them. 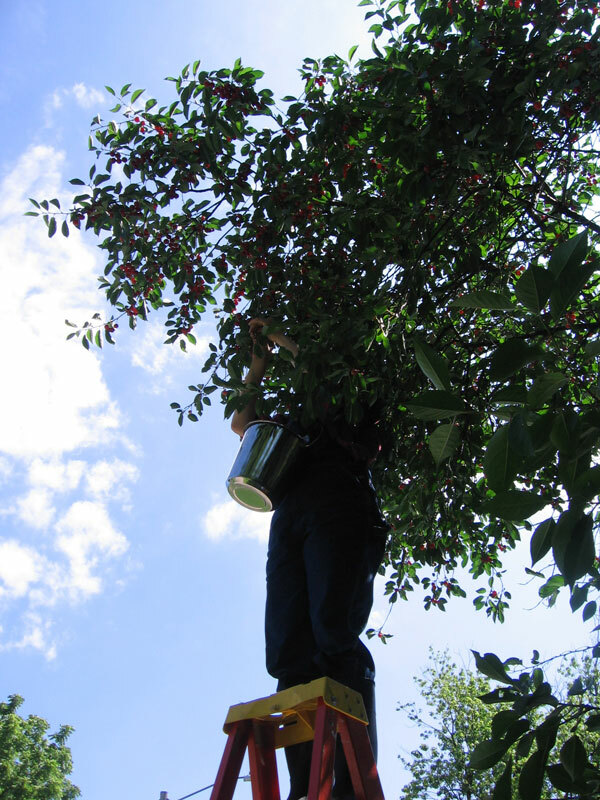 To pick the cherries, which were on a huge tree, my friend Duncan helped me out. 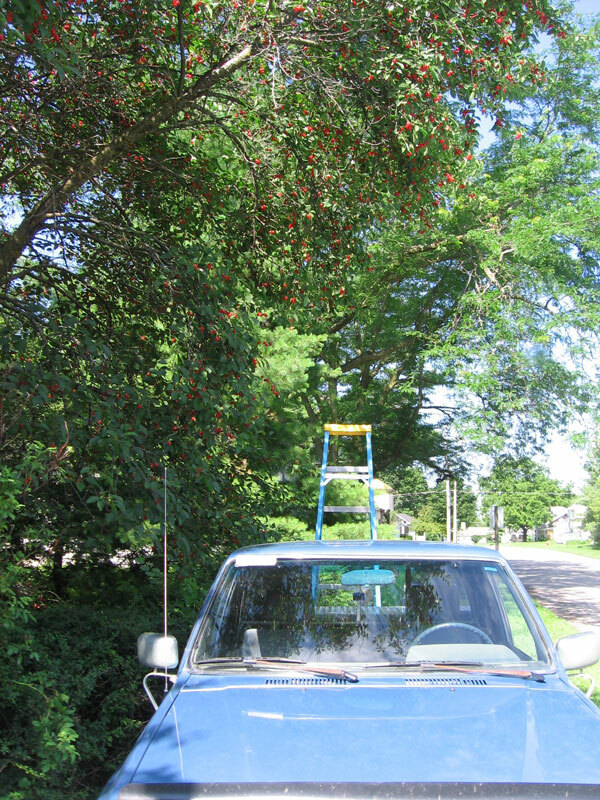 We backed his pickup truck under the tree (over the sidewalk) and placed an 8 foot ladder in the bed of the truck. 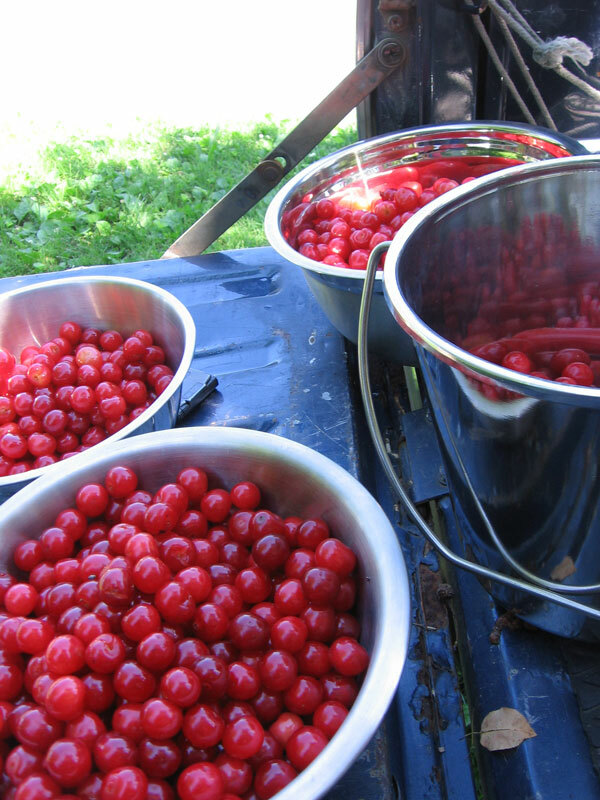 I used a pail with a handle attached to my overalls so that I had both hands free for picking the cherries and balancing. 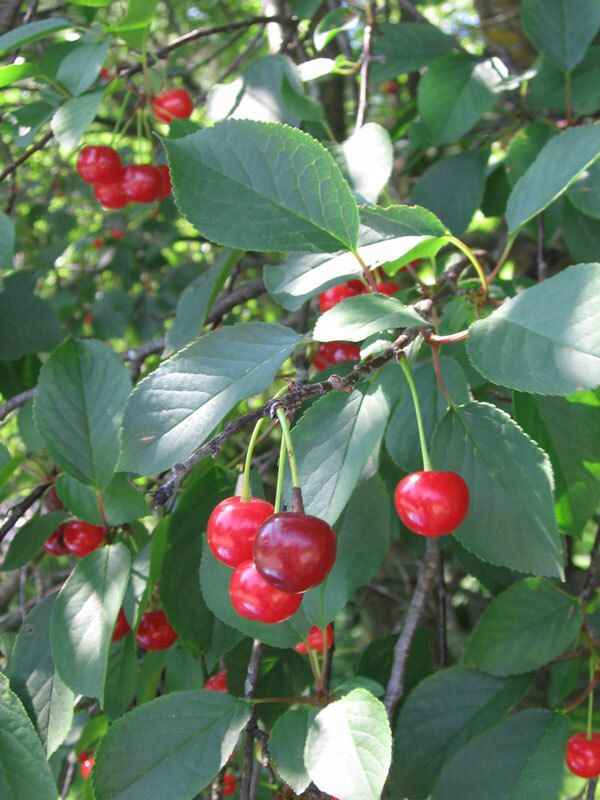 The cherries “cook” for a month, and are supposed to last up to two years. I found the recipe (originally made with brandy) in a cookbook on preserving fruits and vegetables according to French tradition, without canning. I am not one hundred percent sure that I trust this method, and might not end up leaving them in the sun the whole time…not sure. i love this . please send me to the title of the book on french traditional preserves. and also do you recommend a book on jams and preserves ? have you ever made jame without pectin? i have so many questions for you, i miss you. lol. i just read a really amazing book called Nourishing Traditions that talks about fermentation and pickling and how the combinations of things , especially made traditionally instead of mass produced modern, all had a logical purpose in how people ate . It was a good book and had great recipes. Could you send me the titles of the ones you use. I miss you too Monica! My raspberry picking companion! 1. My favorite jam book is called The Joy of Jams, Jellies, and other Sweet Preserves, written by Linda Ziedrich. I highly recommend it. It goes fruit by fruit, and has basic and more complicated recipes for each. I also usually cross reference with the Joy of Cooking, which sometimes takes a slightly different approach. 2. I never use commercial pectin, although sometimes I make it by boiling apples, quince, or other high pectin fruits. There are directions in the canning book I mentioned above. 3. The other book about preserving is called Preserving Food without Freezing or Canning, and it has a forward by Deborah Madison. Highly recommended as well. I wouldn’t necessarily try all the recipes, as some seem slightly suspect, but it is a great reference! I never thought I’d say this but that picture of the cherry tree dripping with fruit makes me really miss living in Iowa. This is a GOOD cherry year. I was just remembering the day that you and Lucy brought the bags of cherries from Ottumwa and we baked all the pies. I haven’t had time to go search for that tree, but I bet it is probably still there!